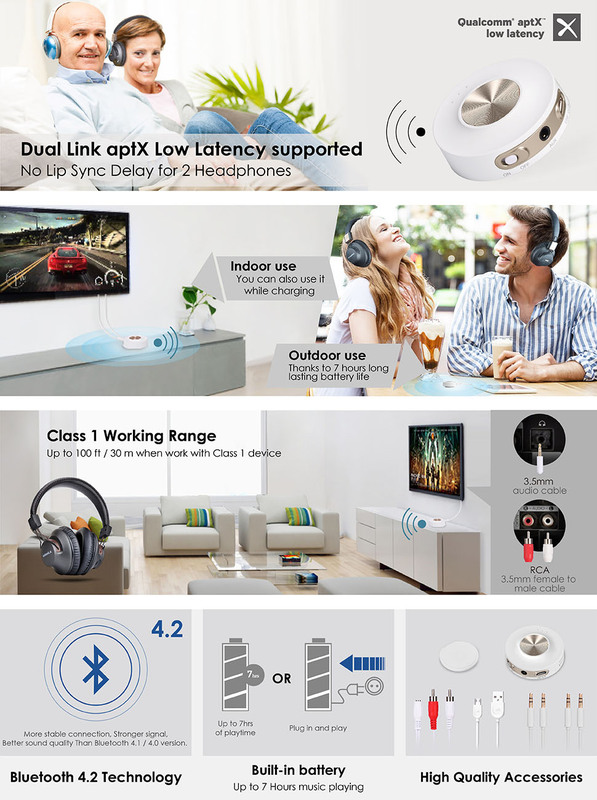 DUAL LINK & NO LIP-SYNC DELAY: Immerse yourself in your favorite movies and tv shows with this world-first dual-link, aptX low-latency-supported Bluetooth multipoint transmitter, which boasts zero lip-sync delay. (NOTE: To achieve low latency (<40ms delay) your receiving device (headphones / speakers) must also support aptX Low Latency otherwise the connection may experience a 70-220ms delay.) 100FT / 30M BLUETOOTH LONG RANGE: Whether entertaining guests, stepping out into the garden or simply relaxing on your cozy couch, the 100ft / 30m range of the Priva IIA bluetooth transmitter enables you to listen to your entertainment system effortlessly. PORTABLE USE WITH 7-HOUR BATTERY: Need a Bluetooth transmitter for outdoor use? With a built-in battery that holds up to 7 hours of power, this is a perfect option for both streaming and charging at picnics, barbeques, parties and more! RECONNECTS AUTOMATICALLY: Spend more time enjoying your music, tv and games – and less time setting them up with this easy-to-use Bluetooth transmitter. Simply switch it on, and you’ll see it powers on and enters pairing / reconnection mode automatically. Easy! IMPORTANT NOTICE: 1) Please test your TV's audio output before purchase. Plug in a pair of wired headphones/earbuds into your TV's audio output to check if it works. If your TV only has optical output, please consider the Avantree Oasis or Audikast instead. 2) Works with ANY Bluetooth compatible device but for low latency please ensure your headphones/speakers support aptX-LL (or use our certified Avantree Audition Pro, Torpedo plus or Clipper Pro). Priva IIA, Multipoint bluetooth transmitter, adding Bluetooth function to TV, DVD, PC or any audio source device, streaming high quality audio to Bluetooth headphones / receivers. It is ideal for watching movies / TV without any lip-sync delay thanks to the latest aptX Low Latency technology. Support Dual Link with NO Lip Sync Delay for both headphones / receivers provided that both of them are aptX Low Latency supported. Built-in battery supports up to 7 Hours music playing which make it portable, and you can take it wherever you like to.